It’s something we all should know by now: Drunk driving is a bad decision. Driving under the influence of alcohol can severely impair your alertness and reactions, posing a danger to everyone on the road. For that reason, the penalties for those caught drunk driving are equally severe. In the United States, drunk driving laws vary by state: Drunk drivers can face lengthy license suspensions and minimum jail sentences of several months, and may be required to have an alcohol-detecting ignition interlock device installed in their car. Meanwhile, drunk drivers in Great Britain can face a one-year driving ban, fines of up to £5,000, and even prison time. The ultimate consequences of driving under the influence can be far worse than that. Drunk driving may cost you your license, but it could just as easily cost you your life or the lives of others. Hundreds of deaths occurred in Britain in 2012 as a result of drunk driving, while in 2013, over 10,000 lost their lives in the U.S. due to crashes involving alcohol. But how else do these countries compare, especially when looking at the number of fatal accidents per 100,000 registered vehicles? We analyzed data from the United States’ Department of Transportation and Great Britain’s Department for Transport on road fatalities linked to driving under the influence, comparing the blood alcohol content (BAC) of drivers involved in these accidents. A higher BAC is associated with greater impairment when driving. 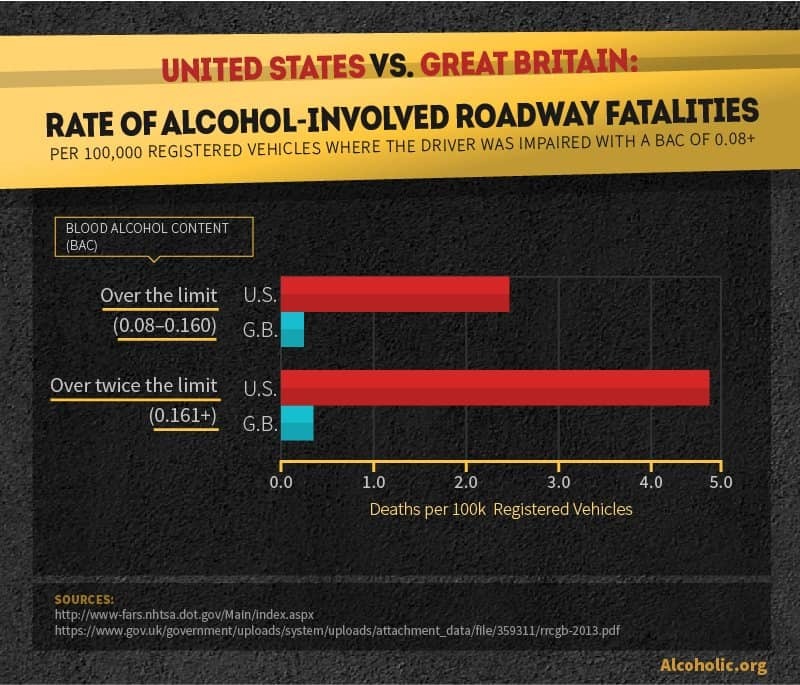 Keep reading to find out how the U.S. and Britain compare with drunk driving accidents. Historically, both the U.S. and Great Britain have shown a decline in drunk driving fatalities since the mid-1990s. Deaths in the U.S. have dropped by more than 35% from 1994 to 2012, and fatalities in Britain have decreased by more than two-thirds over the same period. In Britain, this decrease has been attributed to hard-hitting ad campaigns against drunk driving and a crackdown on high-risk offenders. Meanwhile, the decline in U.S. drunk driving deaths is associated with the rise of license revocation laws and improved vehicle safety design. This trend is certainly a positive development, and it’s one that these countries share. However, there remains a massive gap between their overall prevalence of drunk driving deaths. Without question, problematic consumption of alcohol can produce a broad spectrum of health risks to oneself, but it can also give rise to situations that endanger others. Don’t place your life at risk, or the lives of those around you. Driving under the influence can be a strong indication of an alcohol use disorder. Place a confidential call to 1-888-893-7018 or more information about effective alcohol abuse treatment options. In 2012, Britain showed a rate of 0.296 fatalities per 100,000 registered vehicles where the driver’s BAC was at the limit of .08 or more. 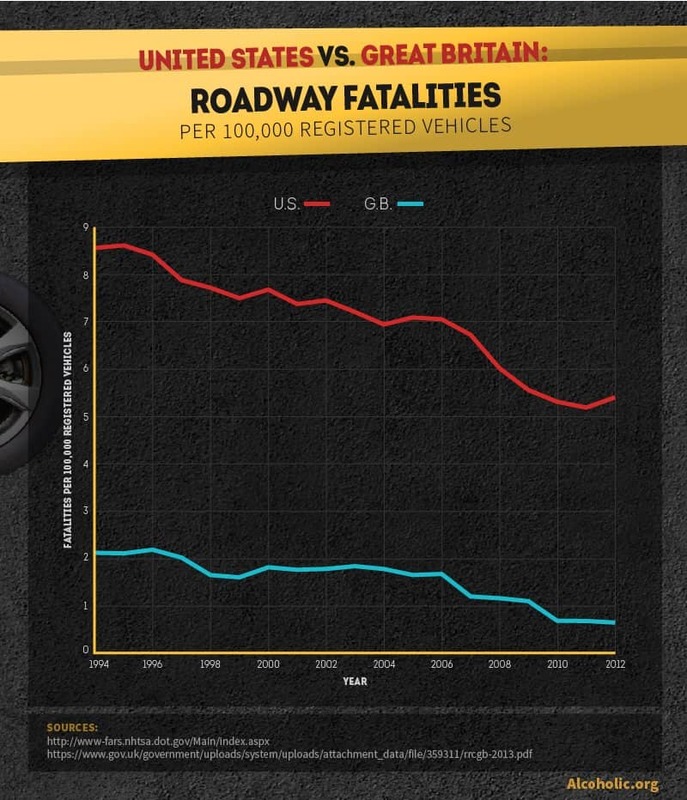 That same year, the U.S. showed a rate of 3.552 for such deaths per 100,000 registered vehicles – 12 times that of Britain. This substantial disparity has been linked to the lack of implementation and enforcement of random breath testing and sobriety checkpoints in the U.S., which can catch impaired motorists even before their erratic driving comes to the attention of police. Notably, American bars often remain open for several hours later than British pubs, giving patrons a greater opportunity to drink beyond the .08 limit. As a driver’s BAC increases, his or her ability to control a vehicle becomes more impaired, leading to a lack of coordination, slowed reaction time, and increased drowsiness. For that reason, the U.S. and Britain count both the number of driving fatalities where a BAC over the limit of .08 was implicated as well as accidents involving a BAC of .16 – twice the legal limit. Looking at the rate of these fatalities per 100,000 registered vehicles in 2012 reveals some interesting patterns. While the U.S.’s overall rate of fatalities remains far higher, the majority of U.S. fatalities involved drivers exceeding a BAC of .16. According to a U.S. National Highway Traffic Safety Administration (NHTSA) study of fatalities by specific BAC, fatalities most commonly occurred when a driver’s BAC was at .17. Beyond that point, the number of fatalities involving higher BAC levels sharply decreases, possibly because the increased intoxication could make it more difficult to attempt to drive at all. In Britain, this trend is reversed: Most alcohol-related road fatalities in Britain involved a BAC of between .08 and .16, possibly linked to the earlier closing time of British pubs. 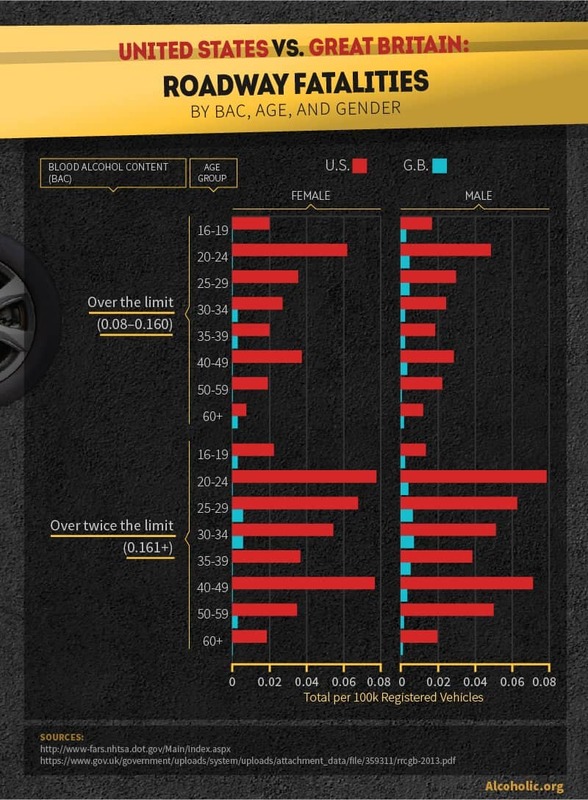 The U.S. and Britain also provide data on alcohol-related road fatalities by age group, showing which age is most likely to be involved in a fatal accident due to drunk driving. In 2012, fatalities with a BAC between .08 and .16 skewed young: The most occurred between ages 20–24 in the U.S., with ages 20–24 and 25–29 tied for first in Britain. 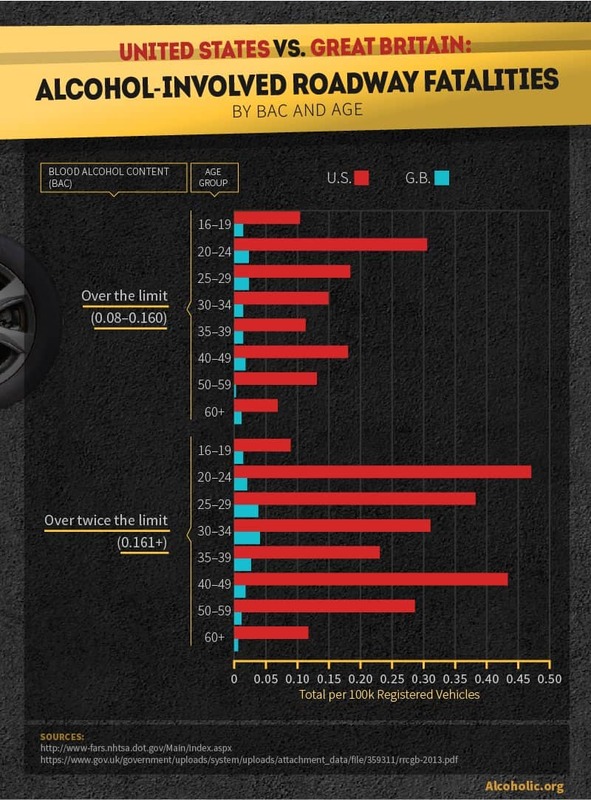 However, among fatalities that involved a BAC over .16, there’s a notable difference in the prominently represented age groups. The most common age group for these fatalities is 30–34 in Britain, and in the U.S., ages 40–49 are the second most common. Lifestyle changes occurring around the early 30s (e.g., marriage, children, and new jobs) are often catalysts for a decrease in drinking, which can result in a lower tolerance to alcohol when it is consumed. At the same time, most deaths from alcohol poisoning occur among adults aged 35–64. This group may be especially vulnerable to excessive drinking and its effects. In the long term, drinking alcohol can place a strain on our health, finances and interpersonal relationships. More acutely, however, alcohol can impair judgment to the point that we place ourselves and those around us in danger. At a tragic extreme, excessive drinking can lead to overdose situations – also known as alcohol poisoning. When sorted by gender, certain trends in drunk driving become quite clear. Among women in the U.S., as with men, alcohol-related fatalities peak both in young adulthood and in middle age. However, in Britain, the number of women involved in fatal drunk driving accidents is minimal. In 2012, British women aged 20–24 and 40–49 actually showed zero fatalities in drunk driving accidents. Sadly, the same can’t be said of British men, whose rates of drunk driving fatalities are several times higher than women’s. No matter who you are or where you are, driving while intoxicated jeopardizes your life and the lives of everyone around you. Drunk drivers are responsible for a substantial portion of traffic deaths around the world. Even those who are fortunate enough to avoid tragedy can still face fines, prison, losing their license, and a drastic rise in insurance costs. If you or someone you know is struggling with compulsive drinking behavior or alcohol abuse, contact 1-888-893-7018 today to find expert assistance. With professional treatment to fit your needs, you can get the help you deserve – before tragedy strikes. Visit www.site.com to find the recovery option that’s right for you, or fill out our contact form for a confidential call-back to discuss your situation. 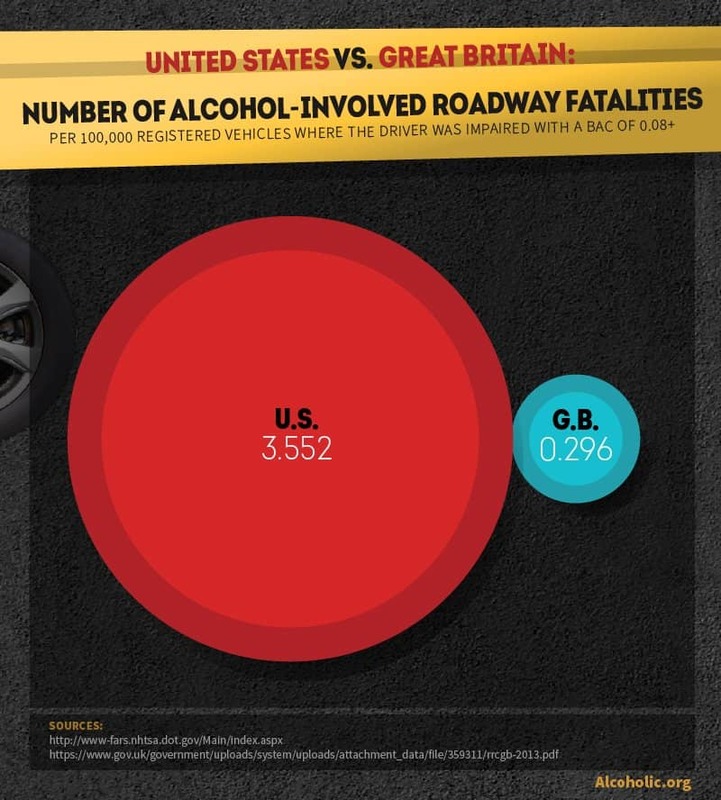 Historical rates of alcohol-related road fatalities were acquired from the U.S. Bureau of Transportation Statistics’ National Transportation Statistics report and the U.K. Department for Transport’s road accidents and safety statistics reports. Current data on measured blood alcohol content and road fatalities were taken from the U.S. NHTSA’s Fatality Analysis Reporting System (FARS) and the U.K. Department for Transport’s Reported Road Casualties Great Britain 2013 annual report.